Emmalani Court is an upscale, very clean complex located in resort community of Princeville on Kauai's North Shore. A golfer's paradise at the Robert Trent Jones Jr. designed Makai Golf Course. Dine at nearby Princeville Resort or Nanea at the Westin Resort, Foodland (grocery store with deli) or the North Shore General Store (by the Princeville Gas Station) where you can find a variety of items, including great burgers made from local beef! 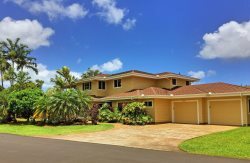 Conveniently located close to shopping (Princeville Shopping Center, Ching Young Shopping Village, and the shops at the Old Hanalei School), hiking trails, ziplining, horseback riding, kayaking, surf and many other fun activities to select from.